French 24 - Local favourites Gaël Monfils and Jo-Wilfried Tsonga have scored key victories to make it to the eight final rounds of the French Open. Once believed out of the running due to persistent pain in his left knee, Monfils says he is hampered no more and is approaching the final full of confidence. "One might call this the first step," said Monfils. "It is always a pleasure to spend a second week at a Grand Slam." But Monfils, who made it only to the semifinals in 2008, says he is far from satisfied. "Now, one must try to go much farther," he said. In the next round, Monfils will face America’s Andy Roddick, the world number six, whom he has not beaten yet this season. Roddick is "a great player, very strong," said Monfils. "I’ve lost to him twice this year. It would be a superb comeback, before my public, in France,” he said of a possible victory against his next opponent. But Monfils wants first to savour his victory against Austria’s Jürgen Melzer. He will ponder a win against Roddick tomorrow, "but not now," he said. "Wouldn't it be nice to win?" On the Philippe Chatrier Court, Tsonga bested Belgium’s Christophe Rochus in three sets (6-2, 6-2, 6-2) and thus also qualified for the final eight. It was a result that might have surprised some, but not him. “Nobody thought that I could evolve like that on the clay,” Tsonga said. "I was often asked, 'What are you hoping for? What would be good for you? To make it through an eighth of the final, a quarter?'" Determined to put an end to this sort of speculation, Tsonga hit a volley back to the journalists: "And to win, wouldn’t that be nice?" 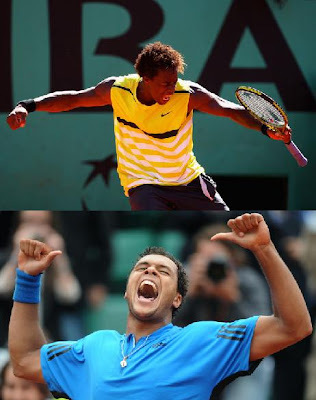 In the coming round, Tsonga will face Argentinean Juan Martin Del Potro, a player who is very at ease on the clay and who defeated Russia's Igor Andreev (ranked 25th) in an all-out match. But when an Argentinean journalist asked del Potro who he expects to win in his match against the local favourite, the fifth-ranked player answered with no hesitation: “the local”.